A collectible calendar. 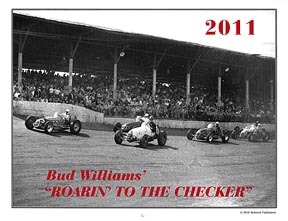 This makes twelve years for this Bud Williams calendar collectible series! Only the best photos were used for this historical calendar. Includes a tribute to the late Mutt Anderson. Don Branson, Pat O'Connor, Bill Schindler, Ted Horn, Cy Patschke, Jerry Richert, Larry Crockett, George Barringer, Tommy Hinnershitz, Pete Folse, Jud Larson, and Jackie Holmes pictures are in the calendar.